In the 80’s and 90’s, infomercials were the king of long-form advertising. 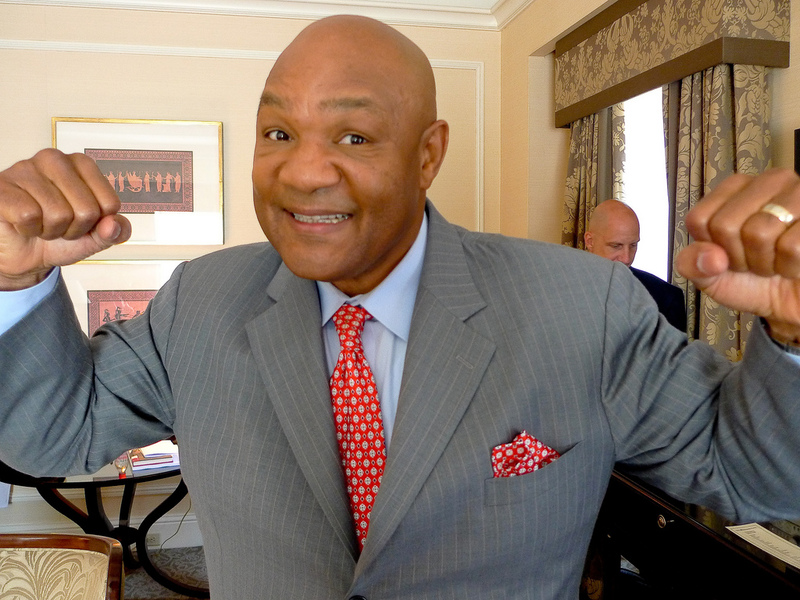 The ThighMaster, the George Foreman Grill, Bowflex, and the unforgettable Richard Simmons all leveraged this novel (at the time) TV advertising strategy to stand out from the traditional :30 commercial. And it worked! Did you know the Total Gym exercise machine has achieved over $1 billion in sales!? See more of the most successful products advertised by infomercial here. They provide a backstory for the product and the company behind it. They demonstrate how to use the product and how it performs while being used. They incorporate long testimonials from users of the product. They include a specific offer. This offer typically includes a product bundle, increasing the perceived value of the offer. Now ask yourself, “When was the last time I sat and watched an entire infomercial?” Odds are you don’t remember the last time, if you ever have at all. Not only do these ads add a layer of depth to their respective brands beyond what any :30 commercial could do, the AT&T and the Nature Valley videos practically double as public service announcements! In a society with increasingly short attention spans, it seems counter-intuitive that a longer ad will resonate with consumers. How can these mini-movies be effective advertisements when most of us spend less than 15 seconds on every website we visit? Josh Steimle, a contributing writer for Forbes.com, takes an in-depth look into how long-form advertising is effective in his article, “Why long form content marketing works, and why it doesn’t.” There are some great case studies in here, looking at real life examples of long-form campaigns and how they outperformed previous traditional strategies. As tempting as it is, don’t sell! Tell a story, something you genuinely find interesting. You’d be surprised how many of your prospects have similar interests to you. Take time on the imagery and aesthetics of the piece. It’s going to take longer to make a longer-form piece of marketing. Don’t let that scare you – it will pay off in the long run. Don’t be afraid to give a “secret” away for free. Consumers crave transparency, and offering tips or advice today (even if they may be part of your “secret sauce”) will be remembered by your audience and they will come back to you in the end. I’ve shared before about Moz’s Beginner’s Guide to SEO, where an SEO company is literally giving way their fundamental best practices for free. While this may help a few small businesses get started with SEO on their own, it much more importantly positions Moz as the thought leader in SEO. Over 1,000,000 hits to this page proves it. Here is one last long-form piece that stuck with me from the first time I saw it shared on Facebook in 2012: Nike’s #MakeItCount video made by independent filmmaker Casey Neistat. He was hired by Nike with this simple mission: make a film about what it means to “make it count.” 14,773,800 views and counting. I think Nike got its money’s worth. In the TV sales business we get asked a lot by prospective advertisers, “How am I going to measure whether or not my TV ads were successful?” This is the $64,000 question. No one, I repeat, no one has this formula down to a perfected science (otherwise they’d be running an ad agency boasting all 100 of the top 100 ad spenders in the world). The Video Advertising Bureau, however, has just released a study which posed the question, “How is TV advertising spend correlated to company revenue growth?” They reviewed 100 big ad spenders from 2011-2014 (post-recession and a span of four years – a solid data set), and the results might surprise you. 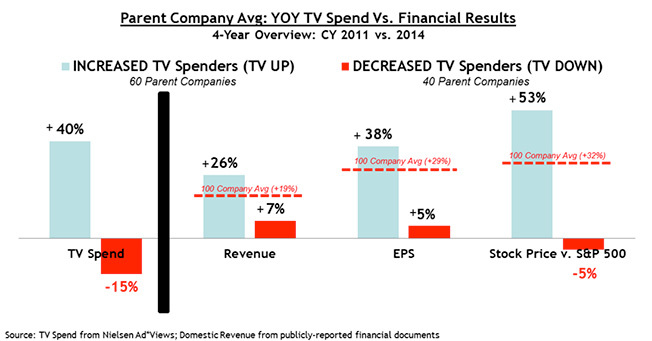 The companies that decreased TV spend saw a 7% increase in revenue. 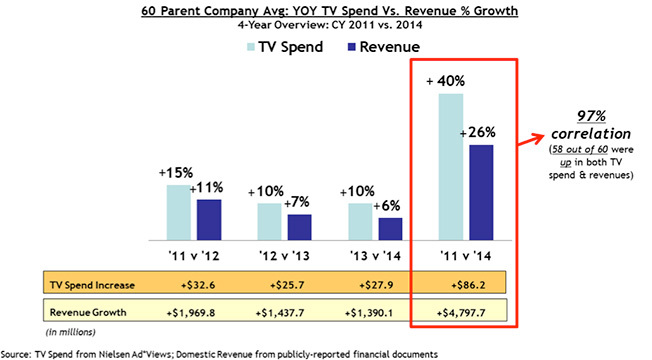 The companies that increased TV spend saw a 26% increase in revenue. In an advertising world of “could-have-influenced” and “might-have-attributed-to,” this data is about as black and white as it gets. One could argue a “correlation is not causation” argument here, which would go something like this, “the successful companies experienced growth, generating higher profits, which gave them a bigger budget to advertise.” While this may have proven true in some cases, the observation that 58 out 60 major corporations saw a positive correlation between revenue growth and TV ad spend growth is undeniable proof that TV advertising is an integral success ingredient in a large company’s marketing strategy. Even a digital company like Zillow admits “TV advertising still works” to reach today’s consumer, and that advertising on TV “is a great way to grow the Zillow brand.” See Zillow CEO Spencer Rascoff elaborate on the subject in this CNBC interview. Have you ever “binge watched” a TV show? I know I have – as soon as the latest season of House of Cards drops, my wife and I have a date with our Netflix account and a bowl of popcorn for the week. This trend started with the advent of TiVO and DVRs, and now with Netflix, Hulu, and Amazon producing their own shows and releasing them all at once, binge watching is becoming mainstream. Especially for, you guessed it, millennials. Why is this important to you as a marketer? 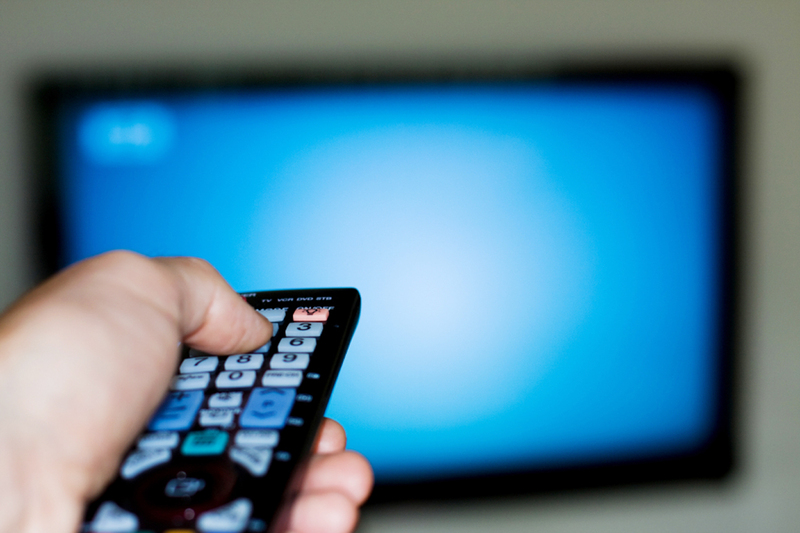 This article, http://bit.ly/1MlnlSY, extracts some key findings from a recent study done by Deloitte, and there are a couple of important marketing lessons to take away whether television is a part of your media plan or not. (Full article copied below my signature and highlights in yellow). Pairing your ads with the right content is more important than ever. Whether you’re advertising during a particular program, running pre-roll ads on YouTube or news sites, or targeting a digital display campaign… the millennials are going to consume this content when they feel like it. Make sure your message is paired appropriately with content aligning with your target audience. Conversely, if your target audience skews older than millennials (30+), relying on day of week and time of day is still important in delivering an effective message. Multi-tasking during TV viewing is a reality. If your marketing campaigns are not fluid across platforms, such as including a hashtag in your video ad that can be accessed and shared across social media, then you aren’t tapping the full power of media. Insert appropriate comic here – http://bit.ly/1ICaPRc.